Crispy shreds of venison with a kapow of flavor! 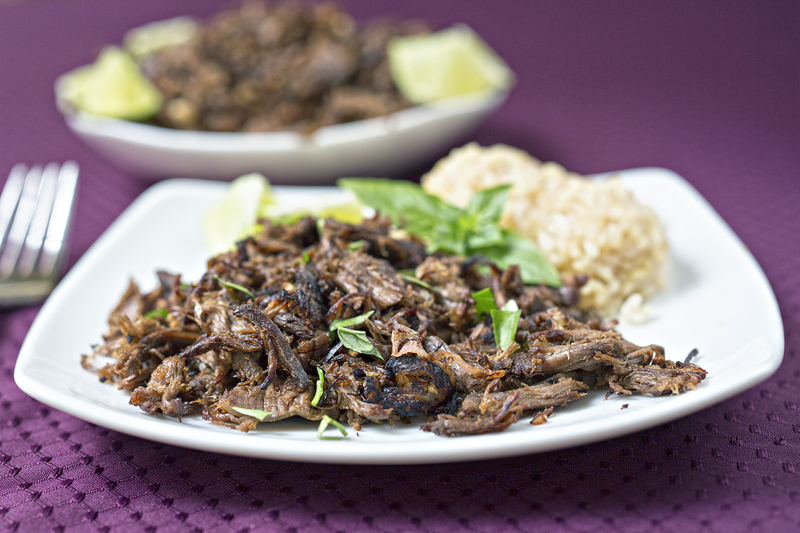 This recipe is a loose derivivative of the Cuban dish vaca frita (fried beef), but instead of using a simple lime marinade, I Southeast Asian-ized it, mostly because I had the ingredients leftover from something else I made. If you don’t feel like hunting down galangal and lime leaves, lime zest and ginger will do. Otherwise it’s the same process: boil meat, shred, fry until crispy. What you end up with is a dish packed with flavor that’s kind of a loose and deconstructed rendang kind of dish (that doesn’t take nearly as long to make). The hardest part about this recipe is boiling the meat until it’s tender enough to shred because venison just takes so dang long to start falling apart. I boiled it for about an hour and it probably could have gone longer, but I managed to shred everything just the same with a fork. You could probably even crock pot the meat while you’re at work, then drain it and do the quick marinating and frying when you get home. For the frying I used unrefined coconut oil and it imparted a subtle but present coconut flavor to the dish that was just lovely. Refined coconut oil will have a little more neutral flavor so I suggest sticking with the unrefined stuff if you have a choice but I wouldn’t make an extra trip to the store for it. In a pot, add the steak with just enough water to cover it and put in the lime leaves, lemongrass, smashed piece of garlic, and galangal slices. Bring to a boil then simmer until meat is tender enough to shred, 30-60 minutes depending on toughness of meat. Once the meat is tender, shred it and add the lime juice, fish sauce, minced garlic, rice vinegar, the sliced pepper, sliced shallots, and a little salt and pepper to taste. Marinate for at least 30 minutes, or up to 24 hours. Heat a skillet to medium high and add 1 Tablespoon of coconut oil. If the meat is very wet from the marinade, dab with a paper towel. Add a portion of the shredded meat to the pan, just enough to cover the bottom. Pan fry, stirring occassionally but not too much, until the meat and shallots are starting to turn brown and crispy. Remove to a plate and repeate with more coconut oil and meat, frying the meat in batches until you are finished. Serve with rice. Non game substitution: I think skirt stake or any stew meat would be nice with this dish.